The railings of the overhead bridge and by pavement are twisted and broken. But that is nothing compared to the destruction at the centre of the road. 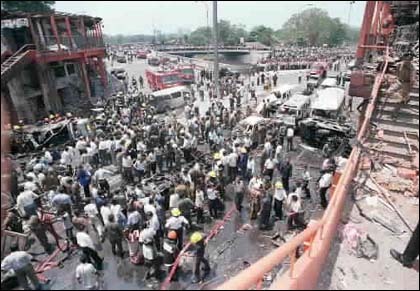 The vehicle, a passenger bus which carried the bomb was reduced to a black mass of twisted metal. There is no evidence of the vehicle's superstructure - only the chassis remains. Two other vans had turned on their side for the impact of the explosion. The intense heat generated by the explosive has blackened the remains and glass from its shattered windscreen litters the road. Two other cars a Indian made Maruti Suzuki and a radio cab were also among the knot of vehicles there. A pickup van transporting water pumps sits on the road, its tyres blown off and the glass of the shattered windscreen strewn all over. The road, boiling under the midday sun was covered with pieces of glass, oil and water - probably used by the fire engines to douse the fire. The place was crawling with police, army and airforce personnel. They have cordoned off the area and are not allowing the public to come near the site of the bomb. Roads were cleared, road blocks were put up to rush the casualties - estimated 35 dead and 230 odd wounded. Ravi Karunanayake MP, and a vocal member of nationalist United Lalith Front was in a dark suit under the sweltering heat with a knot bodyguards in attendance, come to inspect the scene. There was Minister A H M Fowzie and opposition MPs Jayalath Jayewardene (United National Party) too. They came long after it was all over. Some Police sources speculate that the destination of the bomb was not Maradna junction. Though the initial reports are yet to be confirmed and the police are officially tight lipped, it appears the bus with its deadly cargo had its first brush with disaster near a checkpoint at Maligawatte about a mile from Maradana junction. When the vehicle failed to stop, the OIC traffic at Maligawatte police station, Inspector N. R Perera gave chase. The chase had continued up to Maradana junction. At the junction, a police constable had signaled the careering vehicle to halt. It is believed that the driver of the bomb vehicle had panicked at this point and activated the trigger. There are different theories as to what had happened. But almost all are agreed that the bomb was not destined to go off at that junction choked by traffic and throngs of people. There some who speculate that destination was the Maradana police station which is adjacent to the Maradana Railway station. Others feel that the bus was on its way towards the fashionable Horton Place junction, which is down the road in the direction the bus was traveling and meant to explode there. Government ministers and Members of Parliament returning to Colombo from the Parliament House at Kotte for the lunch recess, pass along the Horton place. A clearer picture is yet to emerge of the bombs actual destination.